The Eritrean exile Dawit Mesfin is a bitter man. “There is no news at all of the prisoners”, he says from London. “They have totally been isolated in secret detention since their arrest fifteen years ago. That is an extremely cruel measure against Eritreans who sacrificed everything for the liberation of their country”. Mesfin is still affected about what happened on the morning of September 18, 2001 in the capital Asmara. President Isayas Afeworki on that day committed fratricide. He put 23 critical senior government politicians and soldiers behind bars – all comrades of the thirty-year liberation struggle – as well as twelve prominent journalists. “Of the twelve journalists, we think, five are still alive,” said Abraham Zere, another Eritrean exile. “The last survivors wait in jail for death to come”. The arrests ushered in a period of repression without end. Eritrea is at the bottom of the world list of press freedom, it has never held elections since its independence in 1993. Almost thousand youngsters flee the country every week. Zere calls it “a chilly police state where fear has been implanted in people’s genes”. Independent researchers and journalists rarely get permission to visit the country, so the scant information usually comes only from exiles. 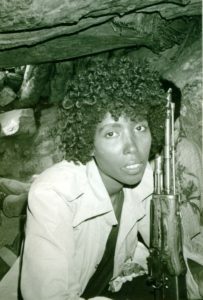 The sister in law of Dawit Mesfin was a prominent warrior in the war of independence against Ethiopia (1961-1991). Also from her there has not been any news for fifteen years. “Every Eritrean family has an ex-combatant among them”, says Mesfin. “We are closely connected to each other. But no one knows how and where those arrested have been”. Abraham Zere was in 2001 a young freelance journalist for the newspaper Zemen, run by editor and poet Amanuel Asrat. “He suspected he would be arrested, but thought it could never last long”, Zere tells about Asrat, who he calls “my role model”. Most detainees disappeared in the infamous Eiraeiro prison. Zere, who works for Pen Eritrea (an international group which agitates for the interests of writers), obtained over the years a little bit of information about them, first by a camp guard and then an anonymus whistleblower: of the 35 taken in detention 15 years ago 15 are still alive. Isayas Afeworki became increasingly autocratic over the past fifteen years. Even the mildest criticism is out of the question. According to Amnesty International three years ago there were ten thousand political prisoners. Eritrea became an isolated and secretive state. Reports from human rights groups and the UN criticize above all the compulsory civilian service, which they call slavery. 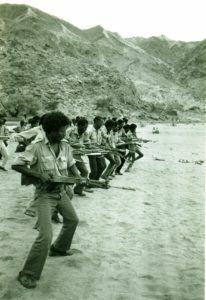 It is a civilian duty for every Eritrean to serve officially for 18 months in the army or in development projects. In practice that service has no end, tiny Eritrea has therefore one of the largest armies in Africa and the government can use free labor. Tens of thousands of young people don’t want to do that civil service anymore and flee the country. Eritrea therefore contributes in Africa the largest proportion to the flow of migrants to Europe. In an effort to stop this flow the EU recently resumed its development relationship with president Aferworki. The stubborn struggle for liberation struggle, it’s independence, it’s stimulating political discussions and their lively press the first few years, Eritrea represented among Africans a real hope of renewal. Now it is one of the most repressive states where residents have little choice but to hope for the death of their brutal dictator. “Eritreans only look at the state television to see if the president looks unhealthy”, says Abraham Zere. 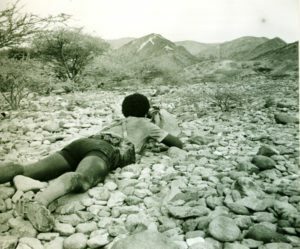 Photo’s by Koert Lindijer in 1986 in the Eritrean bush. Wolde-Ab Wolde Mariam (1905-1995) was the “Mandela of Eritrea,” the father of the nation. At independence in 1993, when the Eritreans had “stomach ache from happiness,” I spoke to him in the capital, Asmara. “Never start an aggressive war” was his warning, “love conquers all” in a free Eritrea. The trembling and withered hand of Wolde-Ab Wolde Mariam still has a remarkable force. Firmly he shakes my hand. ,,Welcome to liberated Eritrea” he proudly says. The 87-year-old “father of the nation”, as he is called in Eritrea, puts down his pen and walks very carefully away from his office desk and invites me on his sofa set. ,,I try to write my memoirs”, he says. “I hope to make it in time because soon I’m going to the afterlife. I can surely say something solemn like that hey? Indeed, it is Sunday”. Four middle aged men enter inside the living room of his home in Asmara. ,,These are fighters of the Eritrean People’s Liberation Front (EPLF)”, he introduces the visitors. “I remember them as schoolchildren”. Wolde-Ab, will enter the history of the soon to be independent nation of Eritrea as the man who gave rise to the struggle for freedom. In the forties, when Britain had taken over power in Eritrea from the defeated Italian colonists, he advocated as a journalist in the Eritrean Weekly News for independence. 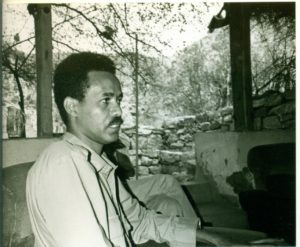 He composed the first Eritrean textbook in the local language Tingrinya, and founded the Eritrean Labour Party that campaigned against the federation with Ethiopia. ,,Seven times the Ethiopians have tried to murder me in the fifties”, he says with a sarcastic smile. ,,Three times there was a bomb attack on me, three times I have been shot at and once they tried to poison me. The Britons advised me to carry a gun with me. But I have always refused that, I would rather die than to arm myself”. Wolde-Ab would have to wait a long time for the birth of his country. After a new attempt on his life, he fled to Cairo in 1954, where with the encouragement of president Nasser he started radio broadcasts to Eritrea calling for independence. The Soviet Union initially supported his endeavor. ,,The General Assembly”, the Soviet delegates had said in 1950 in the United Nations ,,cannot accept an agreement by the colonial powers at the expense of the Eritreans. The only solution is independence”. The Soviet Union in the seventies would revise its opinion 180 degrees and rally behind the Ethiopian president Mengistu Haile Mariam fighting the Eritrean rebels to death. The United States also did choose for their strategic interests at the expense of the Eritreans. They supported in 1952 the federation of Eritrea with Ethiopia and ten years later did not oppose the annexation of Eritrea as fourteenth province in the Ethiopian Empire by Emperor Haile Selassie. The US Secretary of State John Foster Dulles had said in 1952 in the Security council: ,,For reasons of justice the opinions of the Eritrean people must be heard. Nevertheless, the US strategic interests in the Red Sea and security considerations and world peace require that the land is linked with our ally Ethiopia”. A political solution had become virtually impossible. 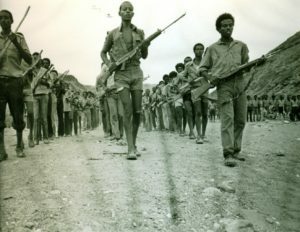 In exile in the Middle East and later Italy and the United States Wolde-Ab supported the Eritrean Liberation Front(ELF) which fired the first shots in 1961 at the Ethiopian army. 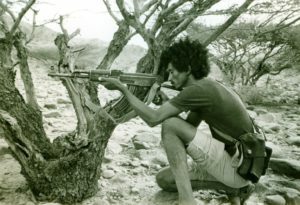 In 1970 he was among the founders of the Eritrean People’s Liberation Front (EPLF), the group that after thirty years would take Asmara in May 1991. The persistence of the Eritreans had overcome the will of the two super powers and the might of the Ethiopian army, which is the largest in sub-Saharan Africa. The EPLF battle cry ,,Never go on your knees”, had paid off. After 38 years of exile Wolde-Ab returned two months after the liberation to his homeland. He excuses himself for his age. His body let him down indeed, although his brains still work well, it takes many seconds before his thoughts transform into words. That is why he rarely gives interviews to journalists. ,,The Ethiopians were worse than the Italian colonists, they were brutal”, he says. Deeply touched and with tears in his eyes he sees how the Eritreans have raised him to Father of the Nation. The referendum held this weekend on the status of Eritrea he considers the best days of his life. 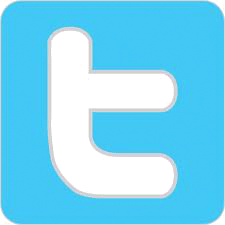 ,,It is the will of God that we have this reached this far and it is by the act of God that I survived”. Since last week every afternoon and night, until dawn, tens of thousands of Eritreans drunk with joy parade through the streets of Asmara. Also in the smallest villages of the country huge feasts are being held. It is as if there never comes an end to this massive festival. Observers from the UN inspecting the ballot boxes were littered with popcorn by jubilant voters. Foreigners find it difficult to understand the continued unity and enthusiasm of the Spartan Eritreans. They look for potential political and social tensions and controversies in the government and the EPLF. After all, one day the intrigues of power games will make their entry, one day the sense of equality will be replaced by jealousy and competition. For example, there are indications that some leaders in the EPLF cannot get rid of their military mentality during the time in the bush and therefore are little open for a process of democratization. Wolde-Ab gives a warning: ,,If I were to give advice to the Eritreans it is: never start an aggressive war. Love will eventually overcome”. Wolde-Ab is exhausted. ,,I got stomach ache from all this happiness these last few days and have to go and rest”, he excuses himself. The gloomiest, the most cynical, the most independent observers and journalists, they all acknowledge the exceptional optimism and find the joy of Eritreans highly contagious. Rarely has an African nation begun so confidently with its independence. Since years there has not been such good news from Africa.